Another car boot, another treasure trove of finds - including an RC hovercraft, sets of Star Wars model kits and a pristine Scalextric set... Awesome! 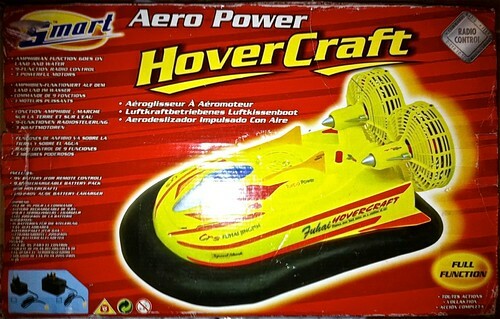 Like the RC boat, the hovercraft features twin props, that deliver forward/reverse/left/right, with a third channel controlling the inflation fan. I've already tested and promptly stripped down the hovercraft, with the aim to upgrade in a similar fashion as the RC boat, but also to fix some major design flaws. The first flaw being the inflation fan's power dropping when the props are driven (the main motors just steal the power from the inflation motor), forcing it to deflate. The second is the gap between the inflation fan and the air intake - there's no ducting, so when the air pressure is high (i.e. when it inflates) the air is blown back along the internal shell of the body and blown out through the air intake. Both of these flaws are fixable, the first resolved as a result of replacing all of the electronics I planned to do anyway in a mirror of the RC boat (putting in two batteries instead). There'll be one battery powering the inflation and the electronics, and one battery powering the twin props. The latter will use the same electronics design as the RC boat. I plan to use the third channel on the Tx/Rx to offer a latching control for the inflation - enabling the hovercraft to be powered on/off remotely. The second problem requires a bit of hacking (that'll be made good with a complete body respray), and involves a piece of ducting being formed between the fan and the air intake. It needs to be lightweight and plastic - the bottom of a plastic disposable cup/pot springs to mind; the right shape, can have a hole in the bottom cut to line up with the fan and can be cut to height to fit the gap (which is considerable). As hinted, I'll respray the entire body shell - I'm thinking in a military grey, accented with red and white safety stripes I'll cut out in vinyl.